Rose Quispe was born in Peru and was raised in Washington, DC. She graduated from Bucknell University in May 2018 with degrees in Economics and French & Francophone Studies. During her undergraduate career, she participated in various international service trips including to Nicaragua and the Dominican Republic. These experiences encouraged her to continue a path in international affairs. She studied abroad for one academic year in Tours, France and received a grant from the Mellon Humanities Teaching Lab to develop a 200-level undergraduate course, now taught at Bucknell University as French Colonialisms. 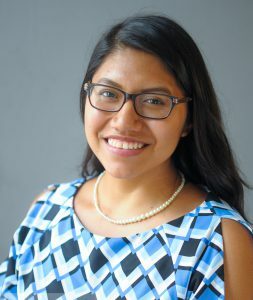 After graduation, she worked at the United States Department of Agriculture, National Institute for Food and Agriculture through an internship with the Hispanic Association for Colleges and Universities. She began her work in the Division of Community and Education, supporting outreach to partner organizations to expand agricultural education around the U.S. She then transitioned to the Center for International Programs where she promoted international collaborations in science among Foreign Service agricultural experts. Rose is eager to join the USAID community to seek long-term solutions for complex issues in international development. She will focus her graduate studies in International Economics at the Josef Korbel School of International Studies at the University of Denver. When she is not reading international development journals, Rose loves to hike, dance bachata and merengue, and listen to music in Spanish and French.